Sleep apnea can not only be startling to experience, but it also carries some hidden health dangers with it. Luckily, your dentist can offer treatment options, like a dental appliance that repositions the lower jaw and tongue, making for a clear airway. Here, the dentists of Adams Dental Center in Lincoln, NE, explain health issues that are related to sleep apnea. If you suffer from sleep apnea, you likely know the feeling of waking up suddenly in the night short of breath. This process causes the body’s hormones to kick into high gear, frequently resulting in high blood pressure. Sleep apnea and obesity often go hand-in-hand. It’s thought that fatty deposits in the neck put pressure on the breathing airways at night, impeding access to oxygen. In turn, the body’s endocrine system is impaired, resulting in the release of hormones that intensify cravings for carbohydrates and sweets—and also slowing metabolism. Scarily enough, sleep apnea can contribute to an increased risk of a heart attack. This may be due to the decreased oxygen that the body receives during a spell of sleep apnea, combined with the physical and mental stress of waking up suddenly. 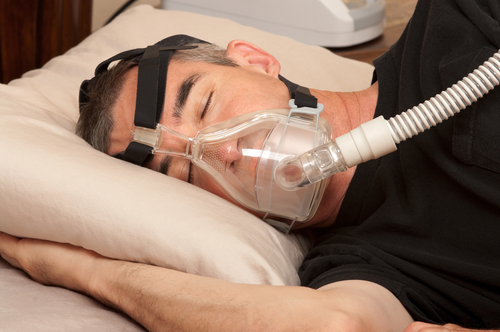 People living with type 2 diabetes are up to 80% more likely to suffer from sleep apnea than the general population. Since obesity is a risk factor for both this form of diabetes and sleep apnea, this may be the link. Additionally, insufficient sleeping patterns can impact your body’s ability to process insulin—which also relates to diabetes. No direct cause has been established between sleep apnea and acid reflux, but the two appear to be connected. Patients suffering from sleep apnea are more likely to experience acid reflux—and often see the condition subside following sleep apnea treatment. The good news about sleep apnea is that it can usually be fixed, and related disorders like those described above are improved in the process. If you want to discuss potential sleep apnea treatments with a dentist in the Lincoln, NE, Adams Dental Center can help. Call the family dentistry pros at (402) 484-6666 to make an appointment, or visit online.